​Due to the weather cancellation of school and activities on Tuesday, February 20, conferences that were scheduled for February 20 have been postponed to Tuesday, February 27. If you were scheduled for a conference on February 20, your time has already been reserved for Tuesday, February 27. If you need to rechedule or cancel, please call the school office at 662-7958. Forest Glen will be hosting its annual Spring Book Fair during parent teacher conferences. The book fair will be open at 4:00pm-8:00pm. ​National School Breakfast Week is taking place March 5-9 with this year’s theme being “I Heart School Breakfast.” Did you know, students who eat school breakfast are more likely to score higher on standardized tests, have better concentration and memory, be more alert, and maintain a healthy weight?! With hectic mornings, your child has healthy breakfast options available at school! Keep an eye out for some of our most popular breakfast items this week as well as a couple of new items. Students will also have the opportunity to participate in activities and receiving giveaways during breakfast this week. March is National Nutrition Month. We take the time to focus on the importance of making informed food choices and developing sound eating and physical activity habits during this month. There is a wide variety of options offered for school breakfast and lunch. Check out http://hssdwi.nutrislice.com/ for healthy offerings, theme menus, and giveaways! In March parents of 4th graders will be asked to choose a 5th grade music class. On March 14, 4th graders will attend a music demonstration at Lineville. Course descriptions and registration information will be available on March 14th, and parents and students will learn about band, chorus, and orchestra classes at Lineville. A selection must be made and the registration completed within two weeks. The Milwaukee Bucks have partnered with Wendy's to offer the Attendance Matters Program. This program enables any student who achieves perfect classroom attendance during the month of February to receive a special complimentary ticket offer. Also, student attendees will receive a free kids meal at Wendy's and the opportunity to shoot a post-game free throw on the Bucks court during a game in March or April! The Forest Glen office will track student attendance and those students who achieve perfect attendance during the month of February will receive a ticket order form to be sent directly to the Milwaukee Bucks. Perfect attendance means a student has been in the classroom each school day in February from 8:45am-3:25pm. ​​Please contact Jennifer Trudell, 4K Coordinator to learn more about 4K at (920)662-7941 jenntrud@hssd.k12.wi.us. Children eligible for 4K must be four years of age on or before September 1, 2018. ​Please join us for the next PTO meeting on Tuesday, March 6 at 6:30pm in the Library. School Board member, Mark Ashley will present information about the April 3 referendum. Plan on attending! 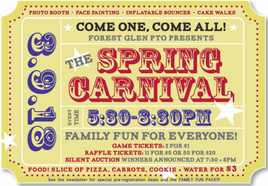 ​The annual PTO sponsored Spring Carnival is right around the corner. The carnival is being held on Friday, March 9 from 5:30pm-8:30pm and is open to anyone and everyone who wishes to have a family fun-filled night of games,inflatable bouncers, raffles, silent auction and food. Pre-register for game tickets and meal now! Click here for pre-registration form. Forms due by February 22. The Carnival committee is looking for donations for raffle and auction baskets. Please click here to find out more! Volunteers are also needed to make the carnival another success. If you can help, please use the link below to sign up! Watch future newsletters for more information about the carnival. 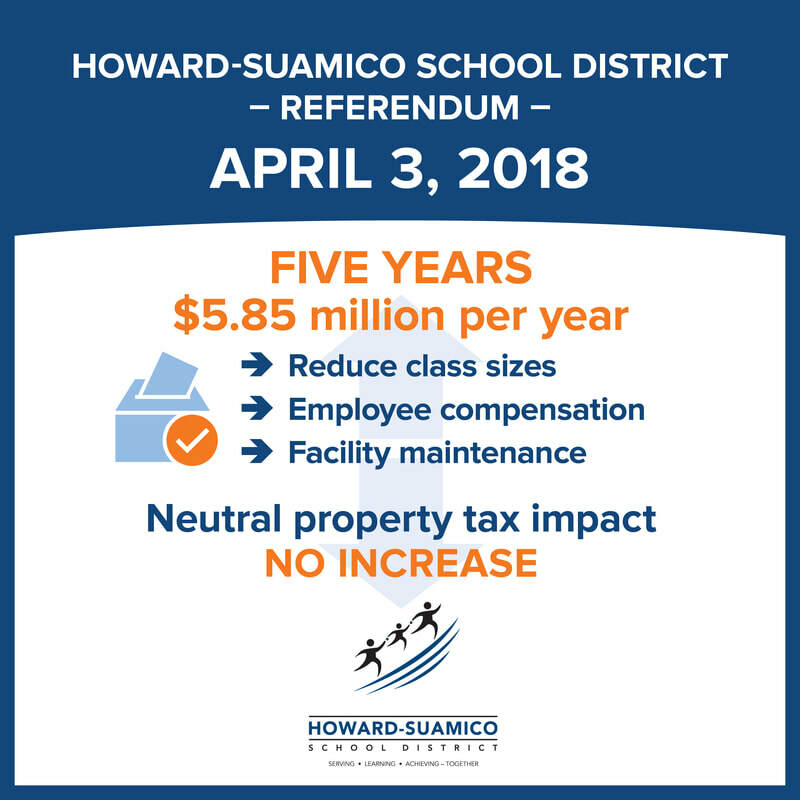 Neutral property tax impact – no increase - honoring our taxpayers with a solid return on their investment. Visit www.hssd.k12.wi.us/referendum for a list of upcoming community information sessions. If you have any questions for the Board of Education, please reach out to your board member listed in this article. The Taste of the Village and Auction to benefit The Giving Tree is offering early bird ticket pricing until April 1, 2018. Stop by one of the ticket locations at Thornberry Cottage, Piggly Wiggly, or Suamico Village offices to get your tickets at reduced prices or go to their website at http://www.hssd.k12.wi.us/taste-of-the-villages-auction for more information. This year's auction features food from 13 local vendors including 1951, Anduzzi's, A&W, Bottle Room, Breadsmith, Festival Foods, Gilligan’s Bar and Grill, Legends, The Marq, The Oilerie, Sam and Louie’s, Townline and Zesty's. All monies benefit The Giving Tree and the health and welfare of our Howard-Suamico children in need. Make a difference and join us on April 19, 2018 at the Rock Garden for this amazing event! March 3 (10 a.m.-3 p.m.) Baseball Rummage Sale at the De Pere Community Center. All proceeds of this event will go back to supporting kids in our community. It will pay for registration fees and other costs related to youth identified sports. Please see this flyer Baseball Rummage Sale Link for more information.